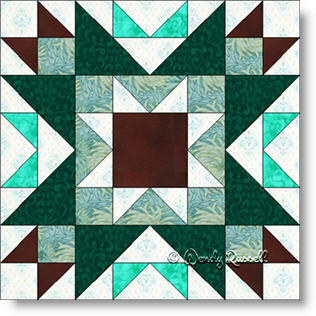 The Odd Fellow's Chain quilt block is for those quilters who enjoy a bit more of a challenge. This block is an eight patch block because it is designed on an 8 x 8 grid. However, it is not constructed as such (at least in my version). I prefer an easier method by breaking the block down into "chunks" and then sewing those chunks together as an uneven nine patch. The block is built using half square triangles in two different sizes as well as flying geese patches. And ... some of the larger chunks contain both of these patches. What is a bonus (of sorts) is that due to the number of cut pieces in the block, you can choose to make a larger sized block and still have lots of interest. Then, it is less blocks to make to get started on your final quilt. The sample quilts illustrated feature one quilt set on point and the other with blocks set side by side. By adding the different coloured setting triangles to each of the blocks set on point, you can showcase more colour options. So, now it is over to you!